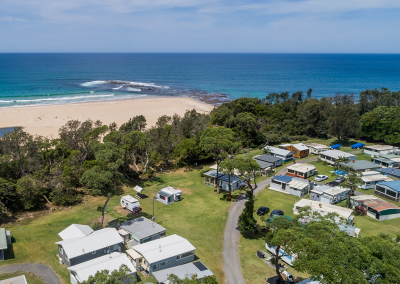 Escape the busy-ness of everyday life and spend quality time with your loved ones surrounded by the incredible natural wonders of the NSW South Coast. 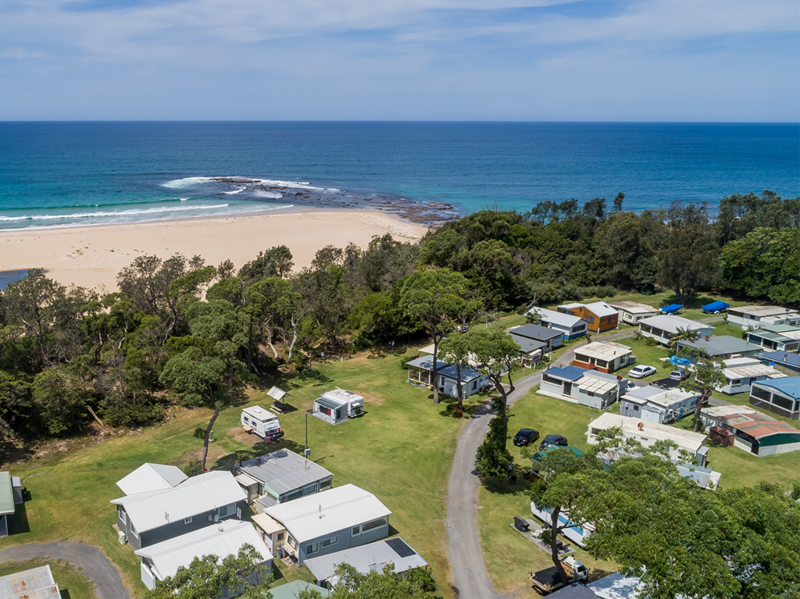 Surfside Cudmirrah Beach offers direct access to the uncrowded and unspoilt beauty of Cudmirrah Beach. 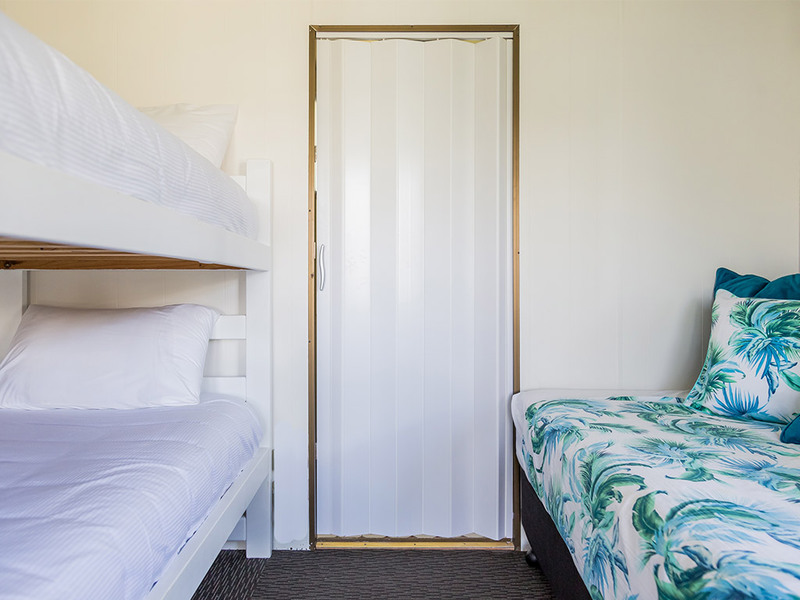 Choose from a variety of accommodation options below. 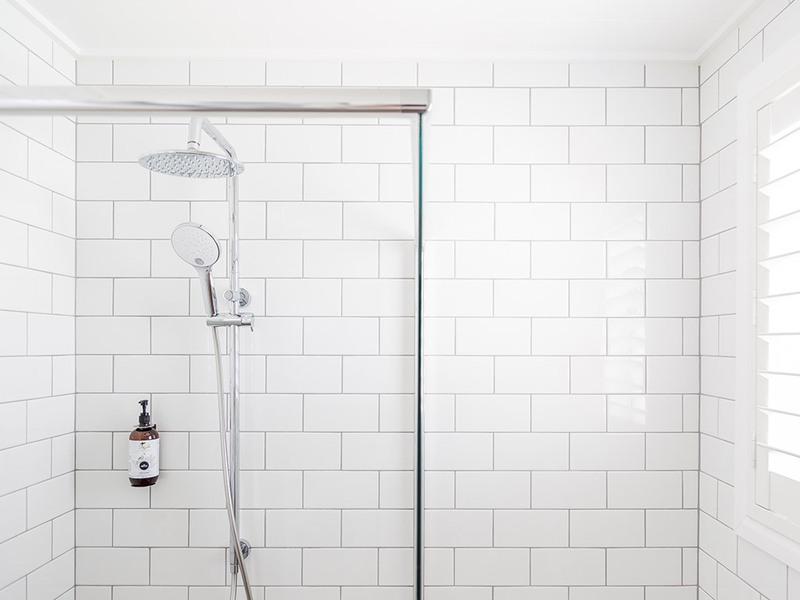 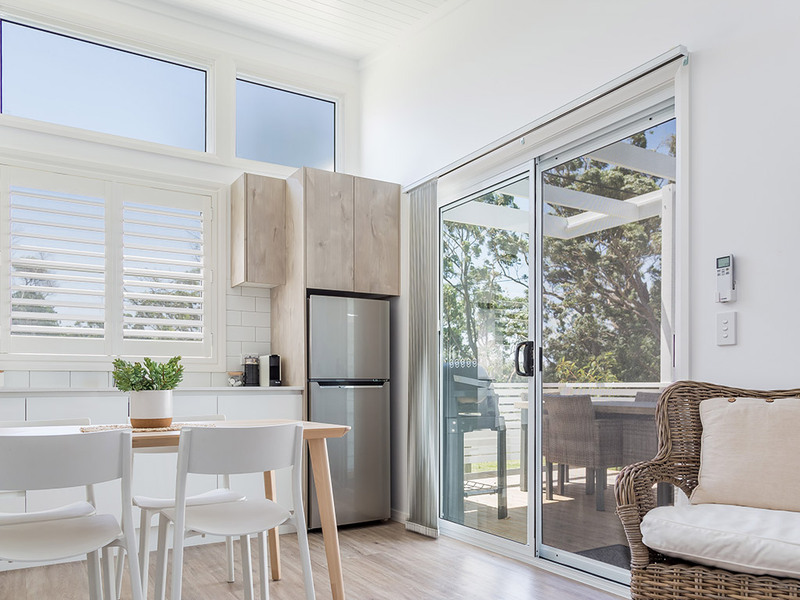 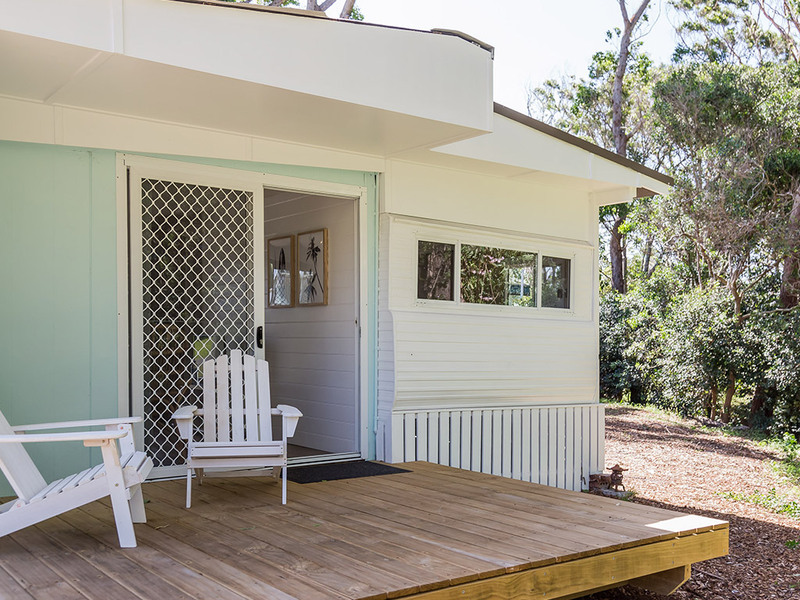 With two north facing, sunny, spacious decks and your own beach shower just outside, you’ll enjoy relaxing after a hard day at the beach just a few minutes stroll away. 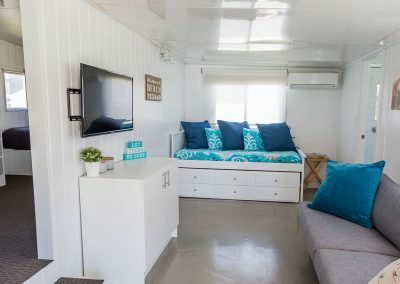 Featuring 2 spacious bedrooms, one with a king bed and the other with a queen bed and set of single bunks for the kids. 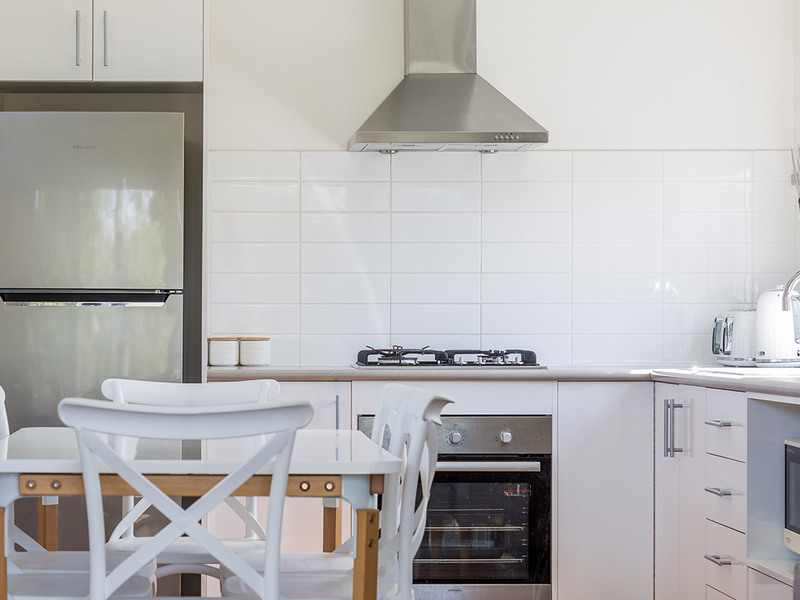 The kitchen is fully equipped with a gas cooktop, oven and microwave. 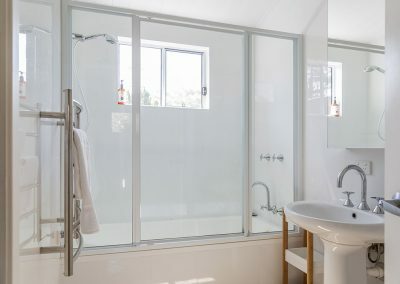 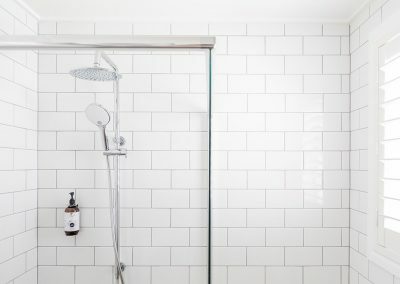 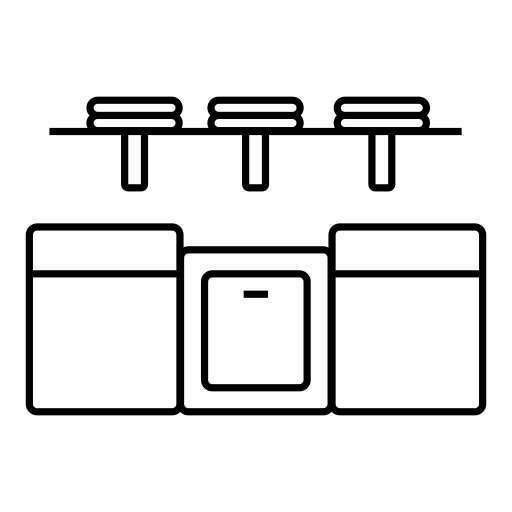 The bathroom has a nice deep bath for soaking with a shower overhead and also a washing machine and dryer. 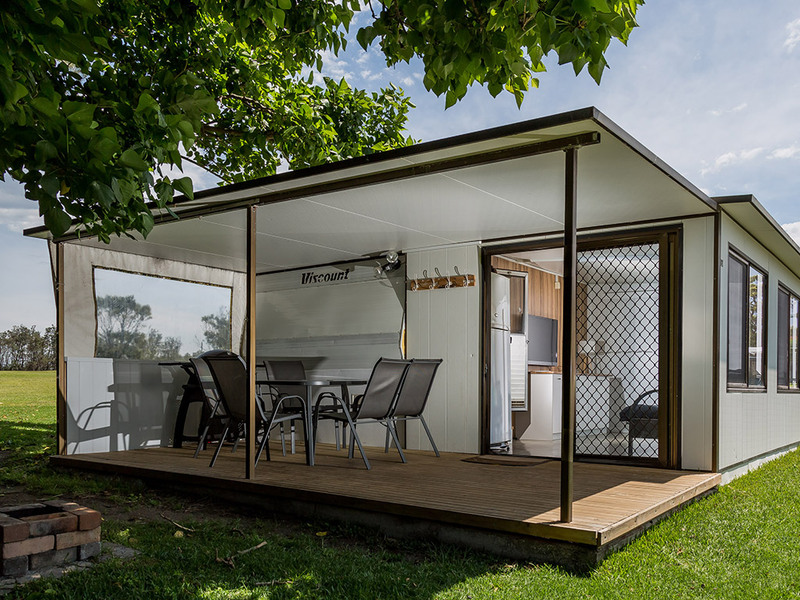 A Weber Q and plenty of outdoor seating make this cabin perfect for larger families or groups of friends. 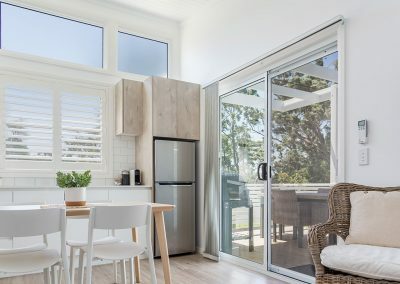 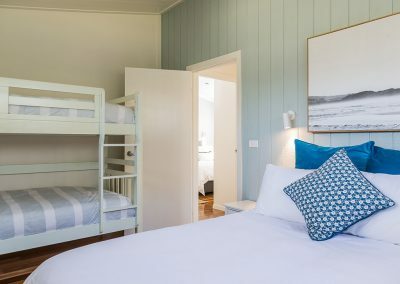 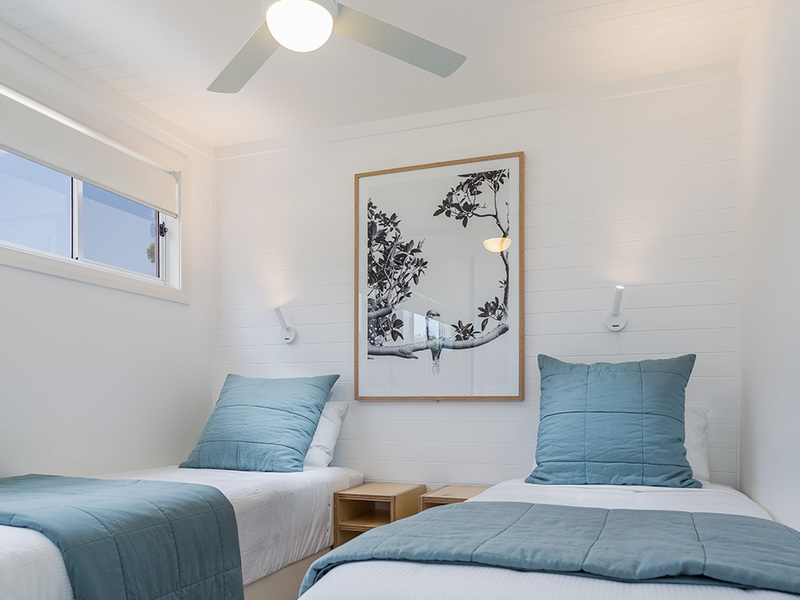 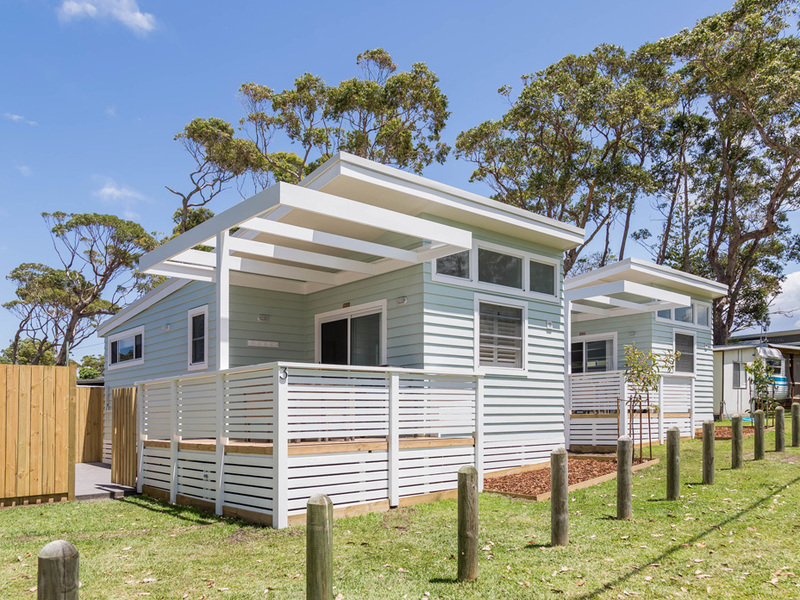 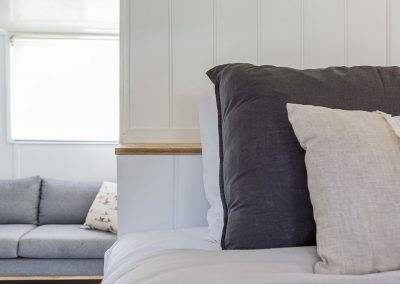 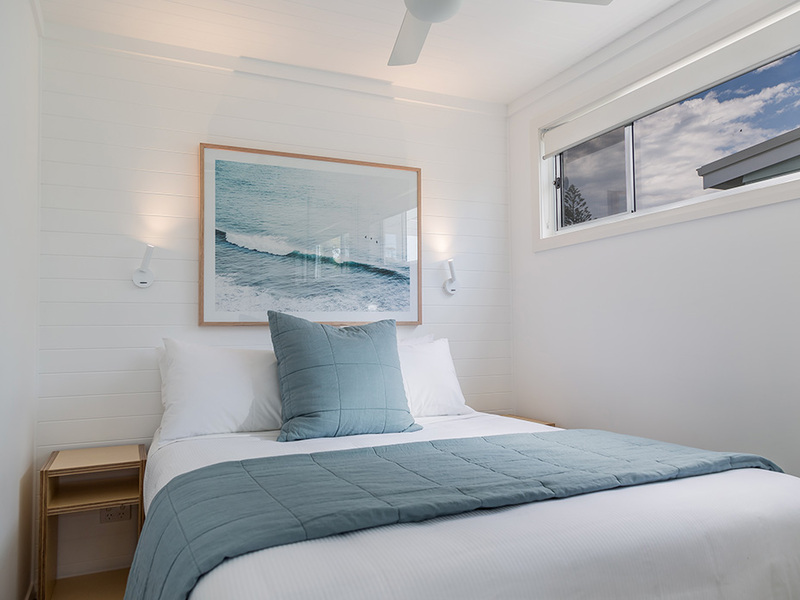 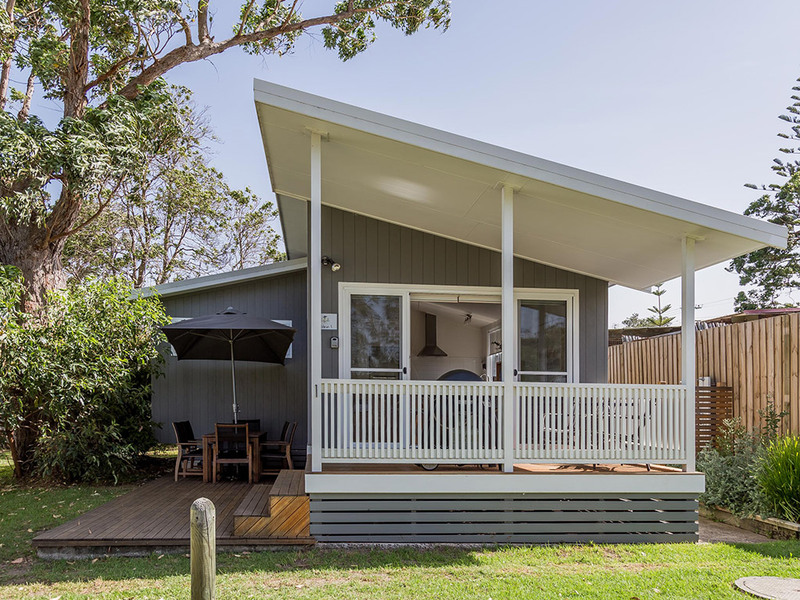 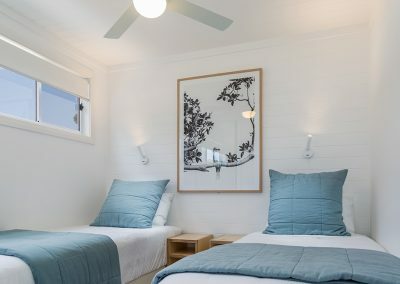 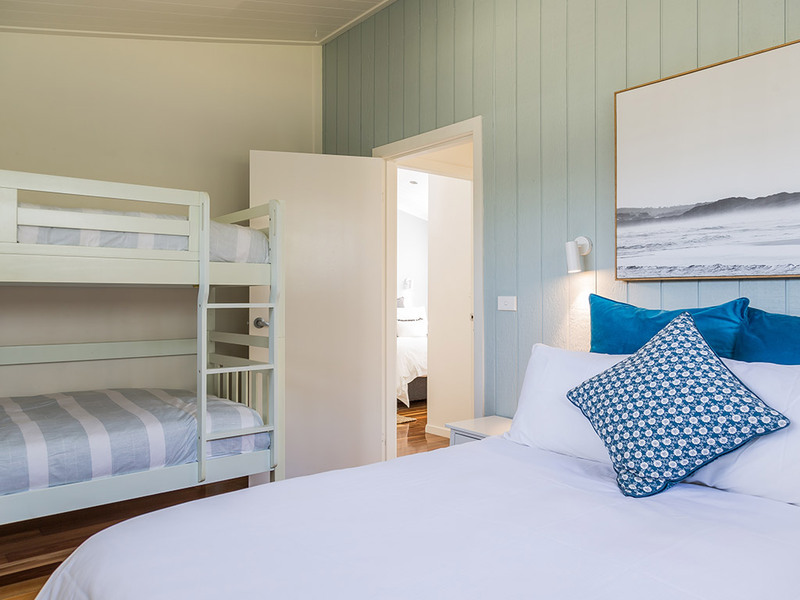 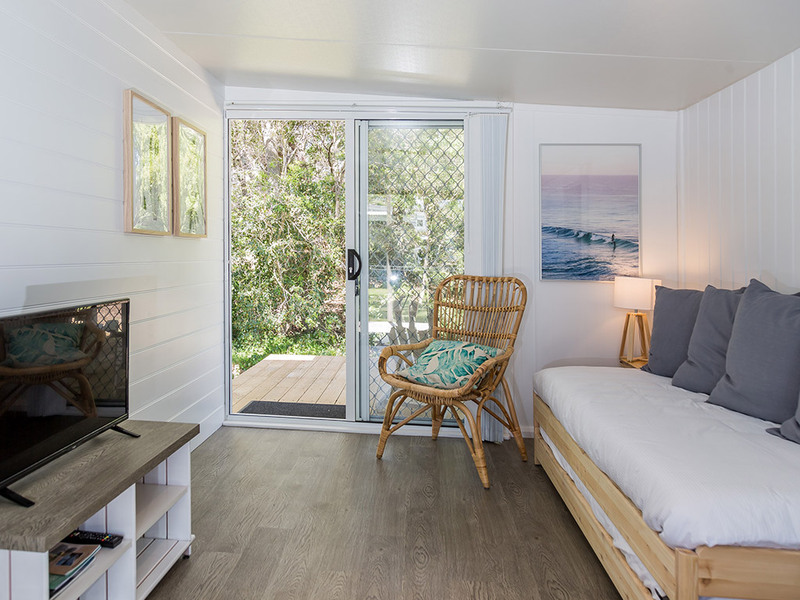 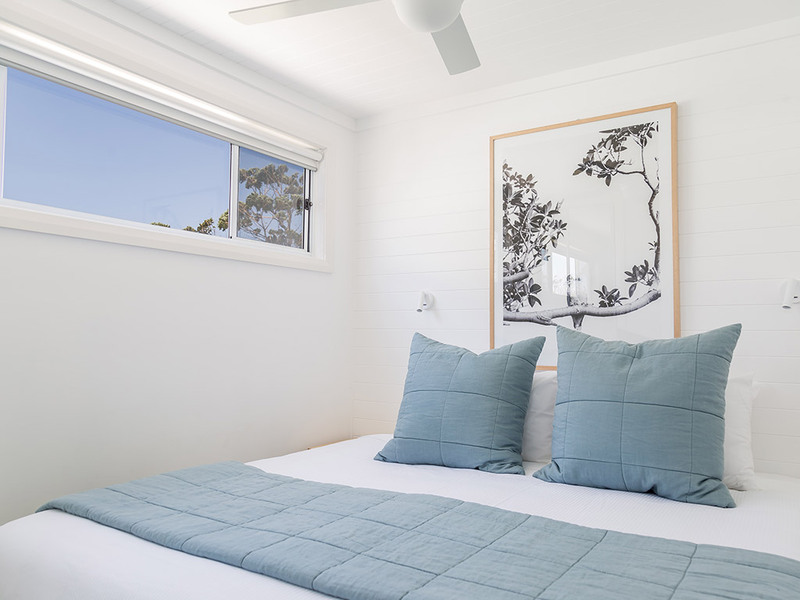 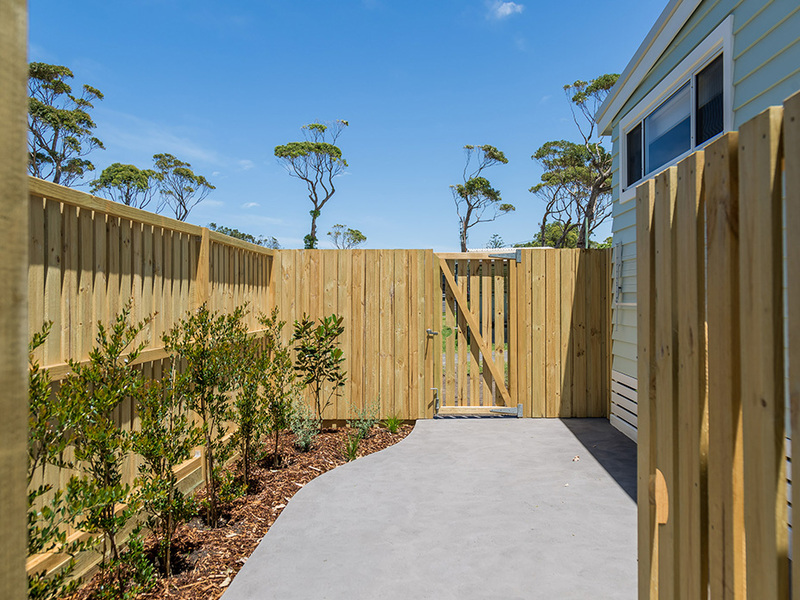 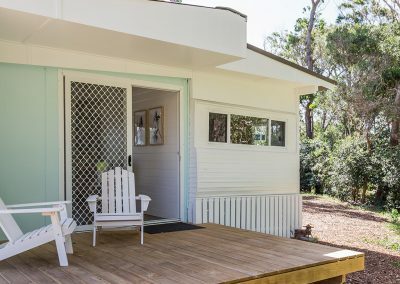 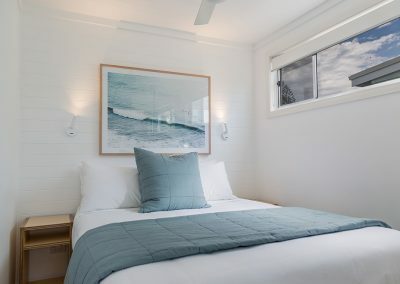 Our brand new Surfside cabins are north facing with two bedrooms, one with a Queen bed and the other with two long singles that can be combined into a King bed to accommodate a family of four or two couples. 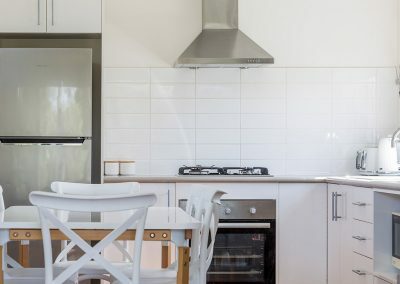 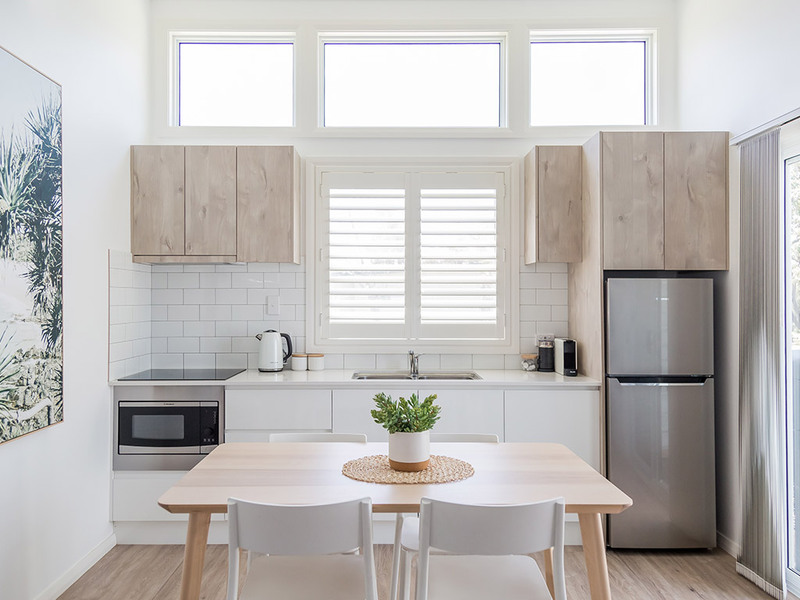 The kitchens feature a caesarstone benchtop, electric cooktop and built in microwave. 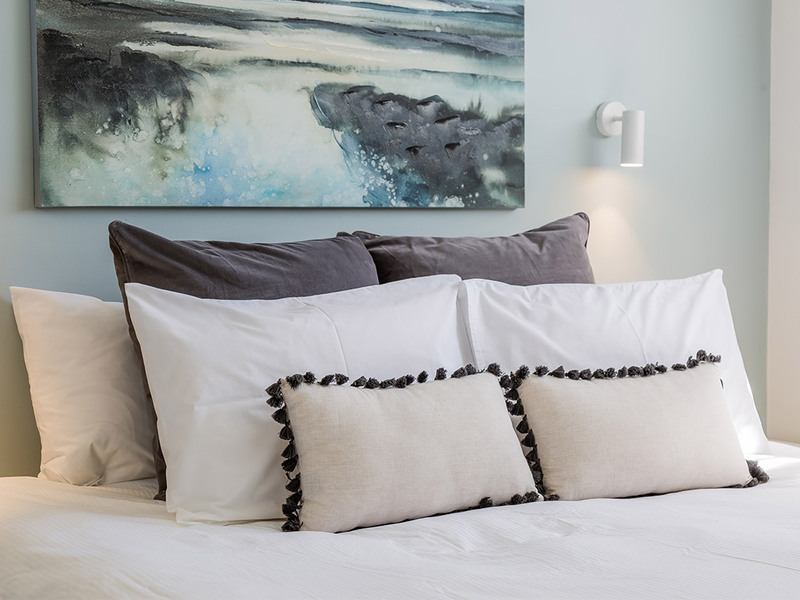 Quality linen and towels are provided. 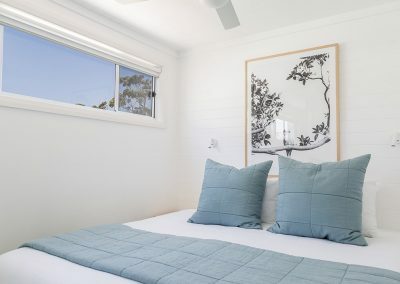 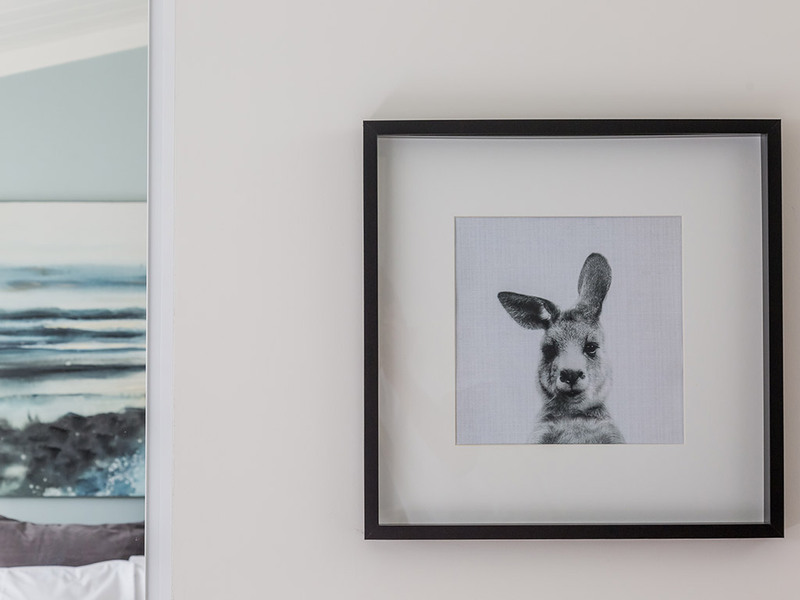 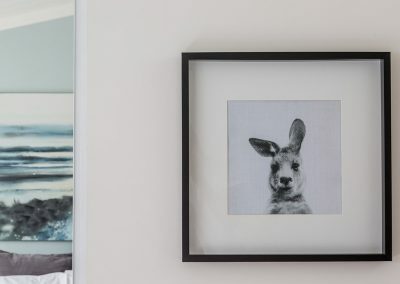 Gorgeous artwork on the walls, a koala brand comfy sofa and a sunny deck to watch the world go by. 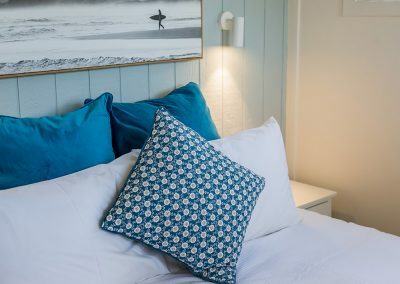 These are for those holiday makers that like a little bit of luxury by the sea. 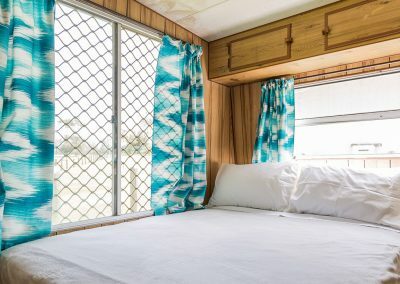 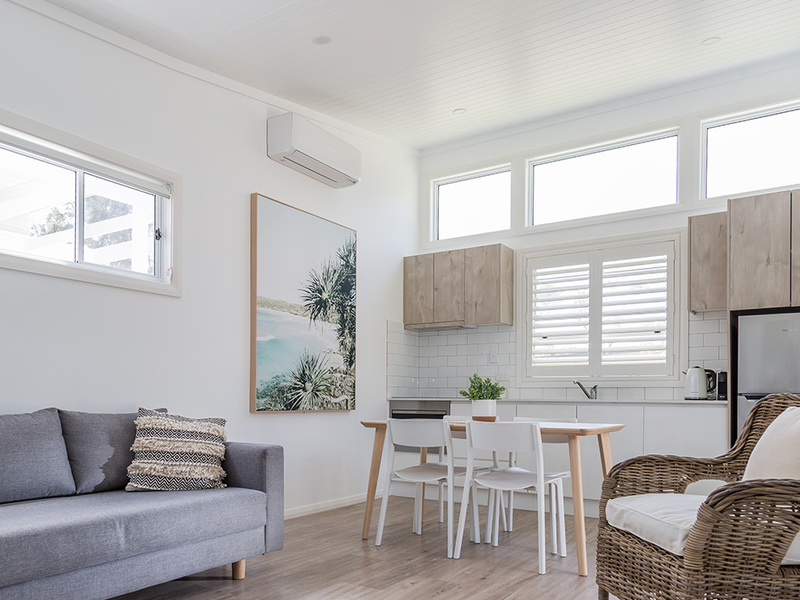 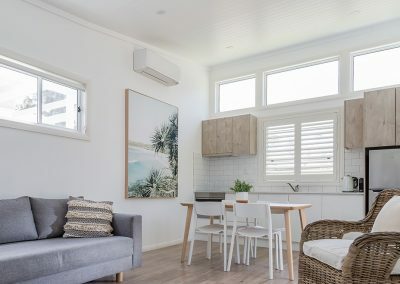 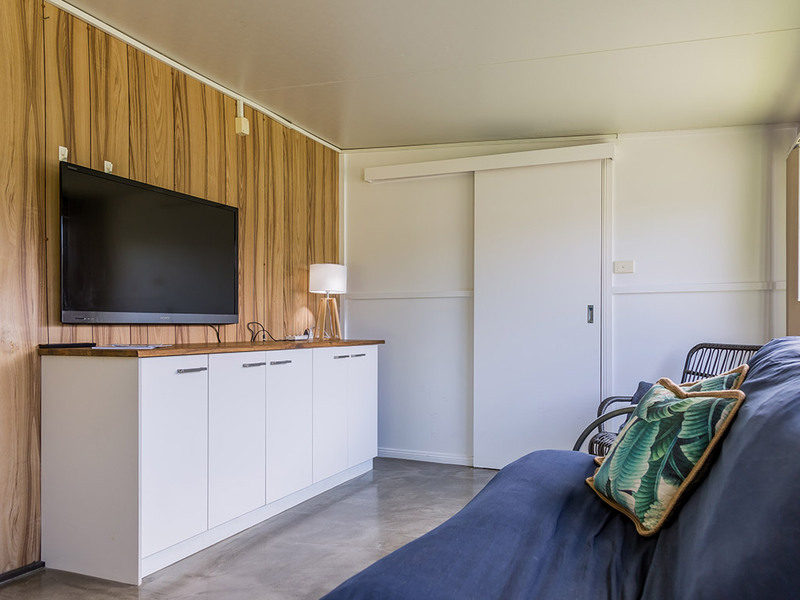 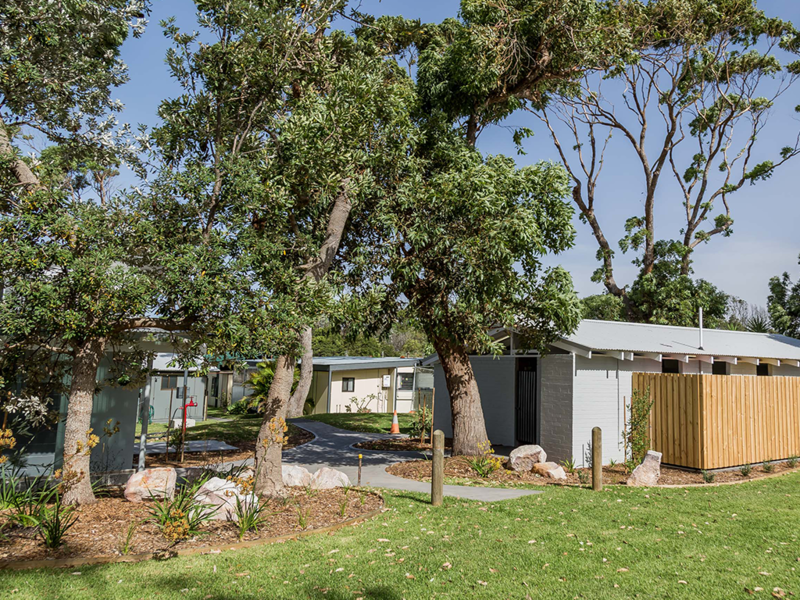 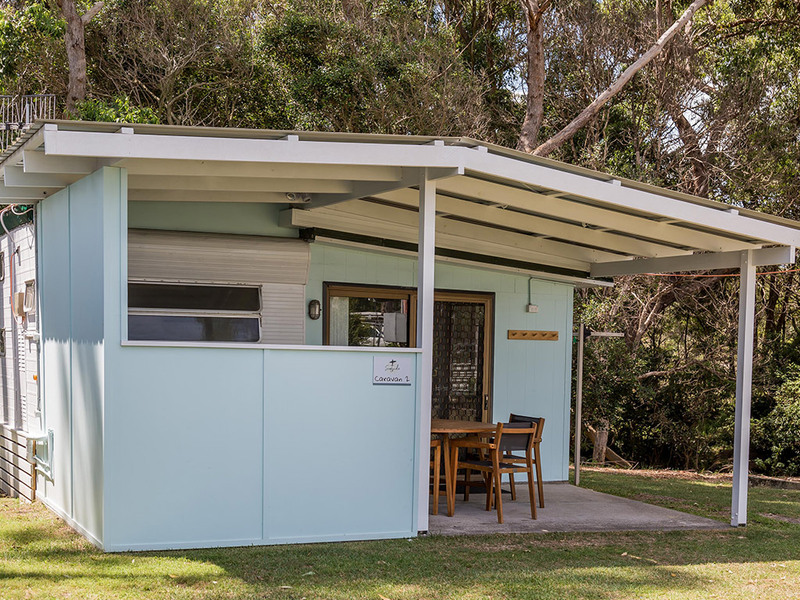 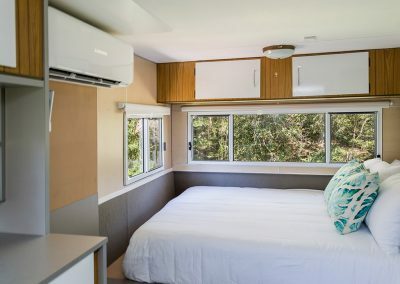 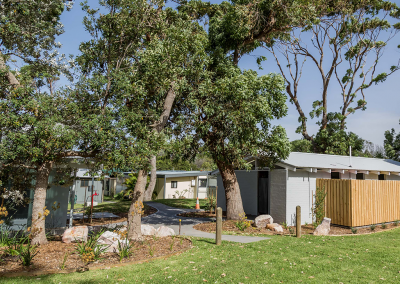 Our air conditioned, renovated caravan and annex with brand new ensuite offers a more budget friendly option while still maintaining a bit of luxury. Inside the caravan is a queen bed and a king single bed. 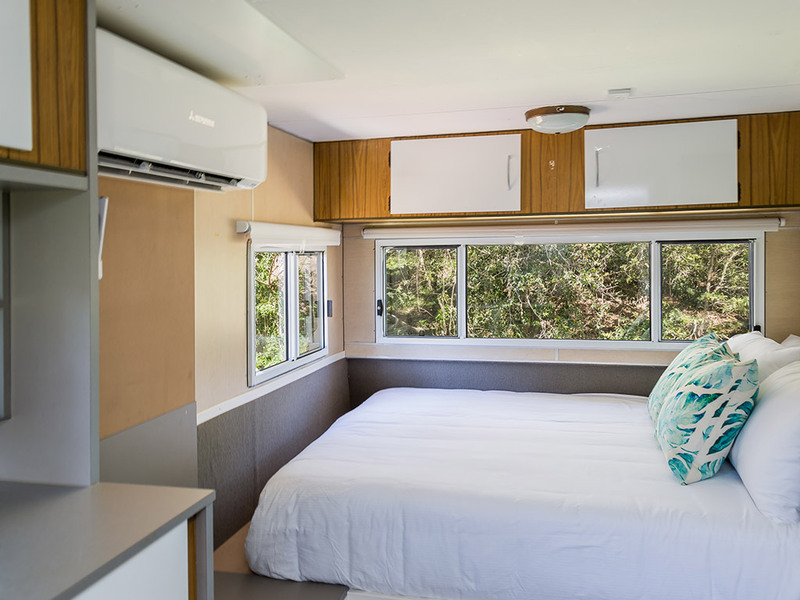 The annex has a lounge, smart TV and a day bed with a single trundle bed underneath. 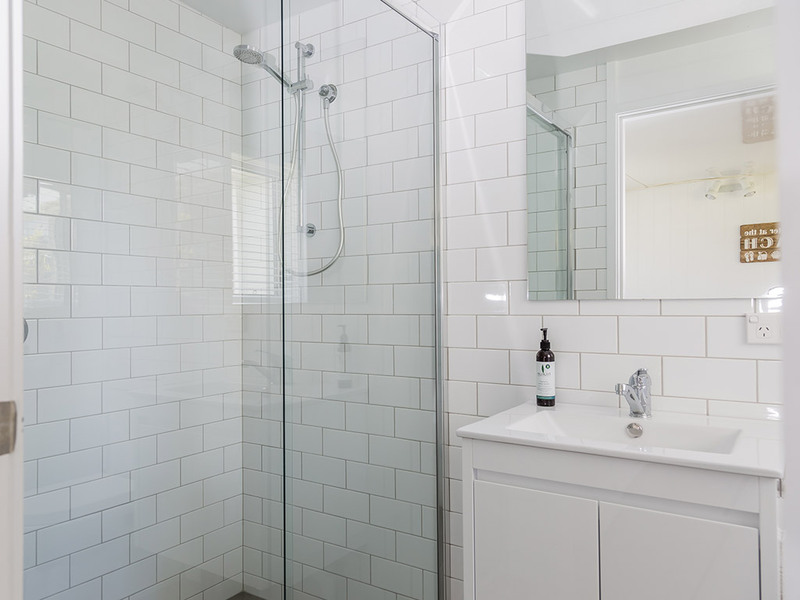 The spacious ensuite has a toilet, shower and hand basin. 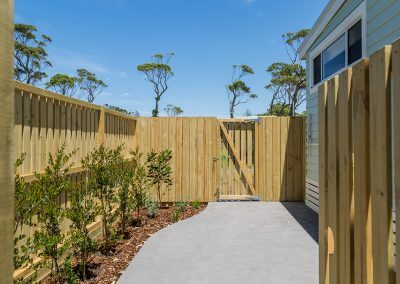 It also features a relaxing, north facing undercover outdoor patio with a kitchen. 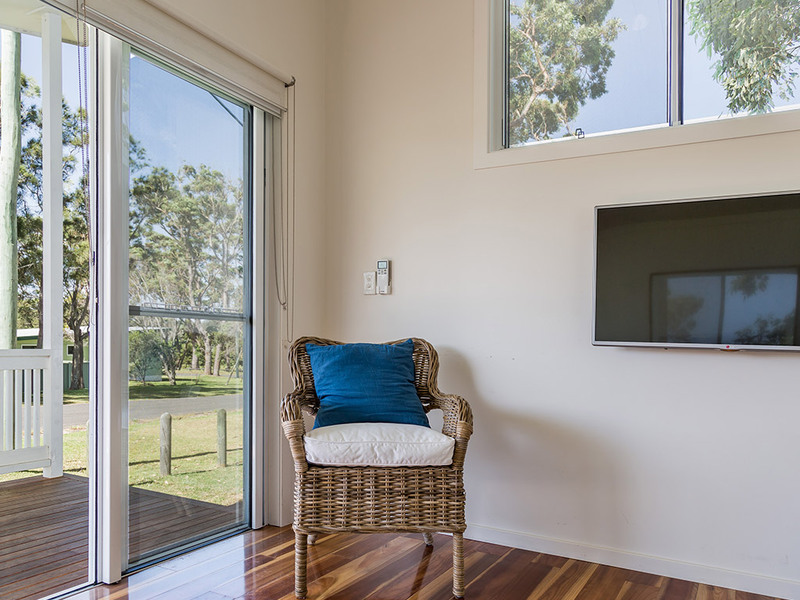 The patio can be fully enclosed with clear roll down blinds and we supply an outside heater for those colder winter nights. 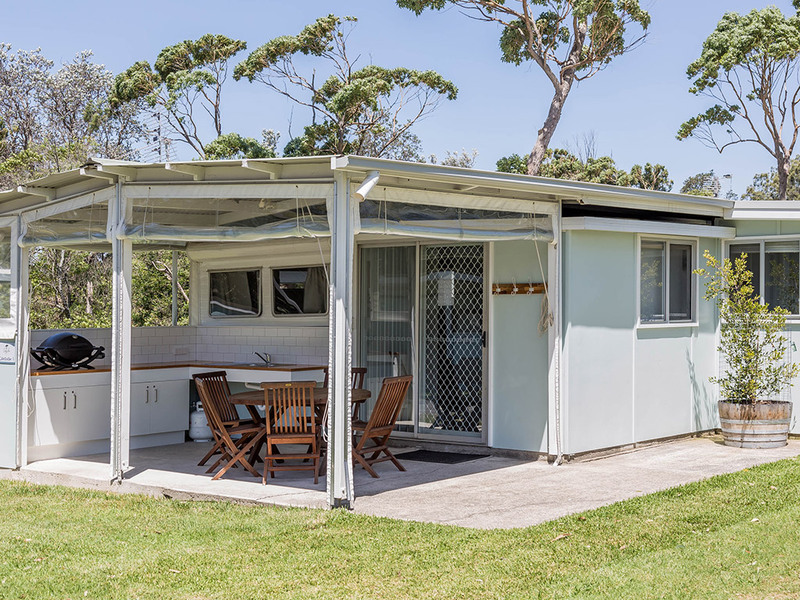 A great option for a budget family holiday, this caravan and annex with ensuite sleeps 5. 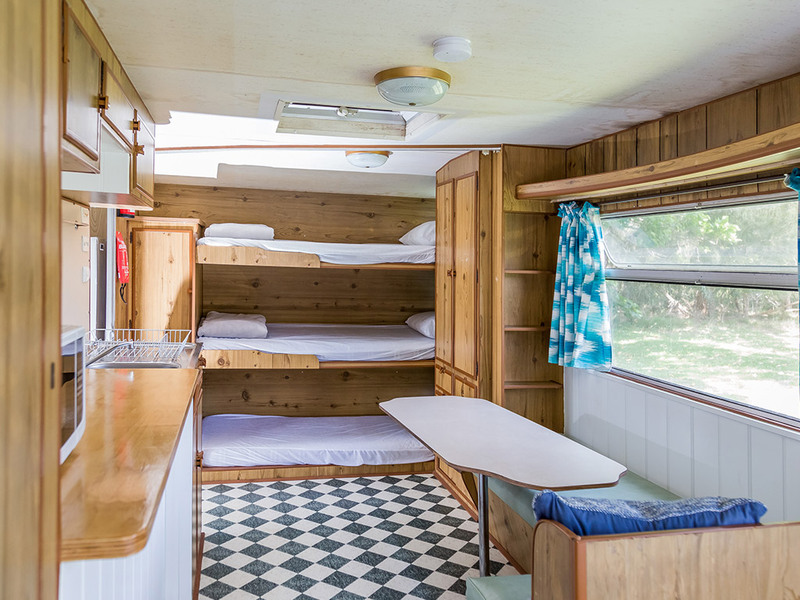 Featuring a double bed in the caravan and a single bunk, king single bed and sofa in the annex. 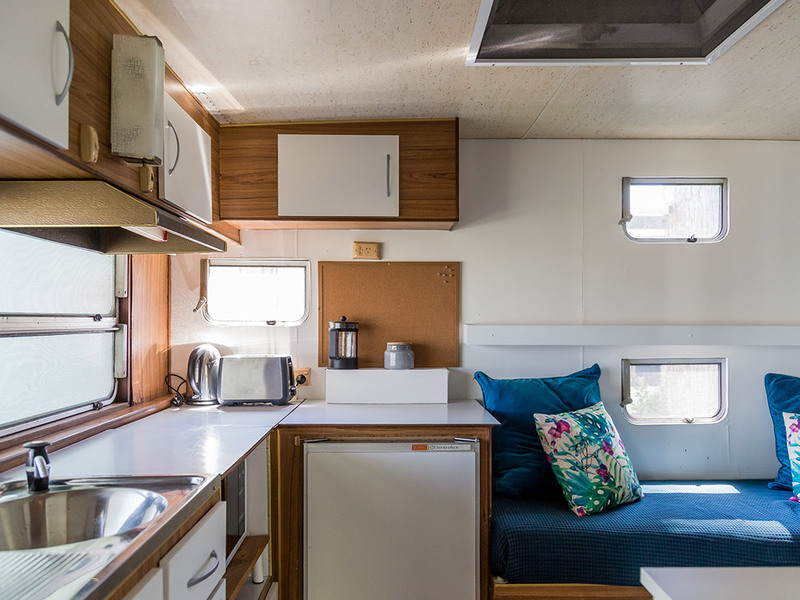 There is a kitchenette in the caravan with microwave, kettle and toaster and a full sized fridge in the annex. 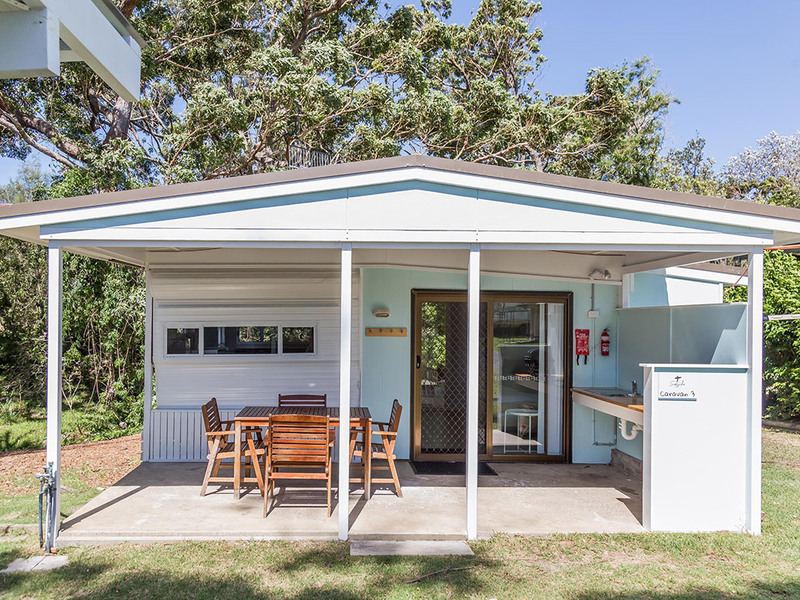 The kitchenette is fully equipped and linen and towels are supplied, just bring your beach towels. Smart TV with Netflix and lounge in the annex and a large covered verandah with outdoor setting at the front to relax under. 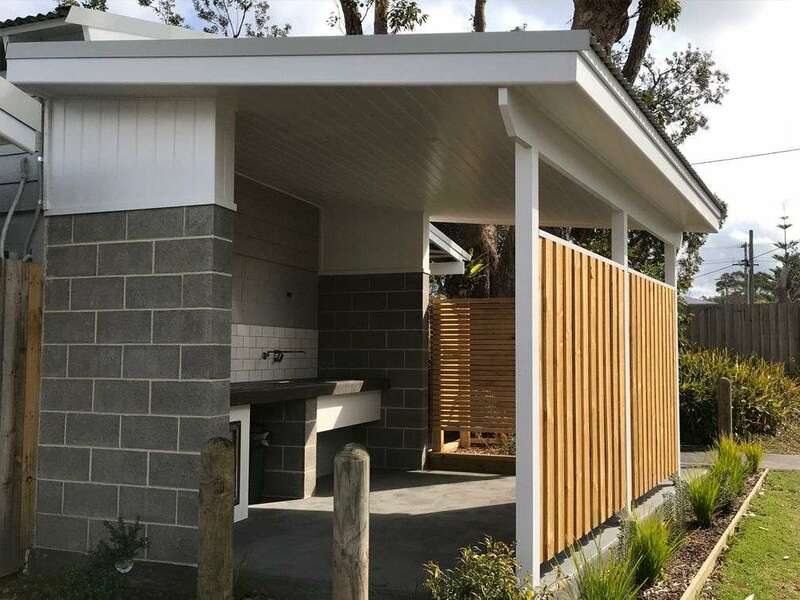 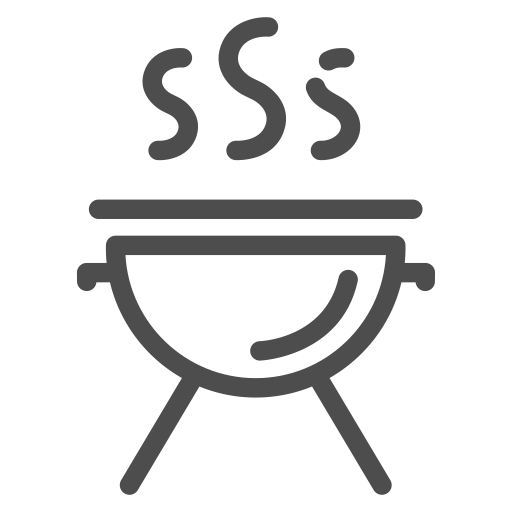 The outdoor kitchen has a sink and Weber Q. WIFI access also available. 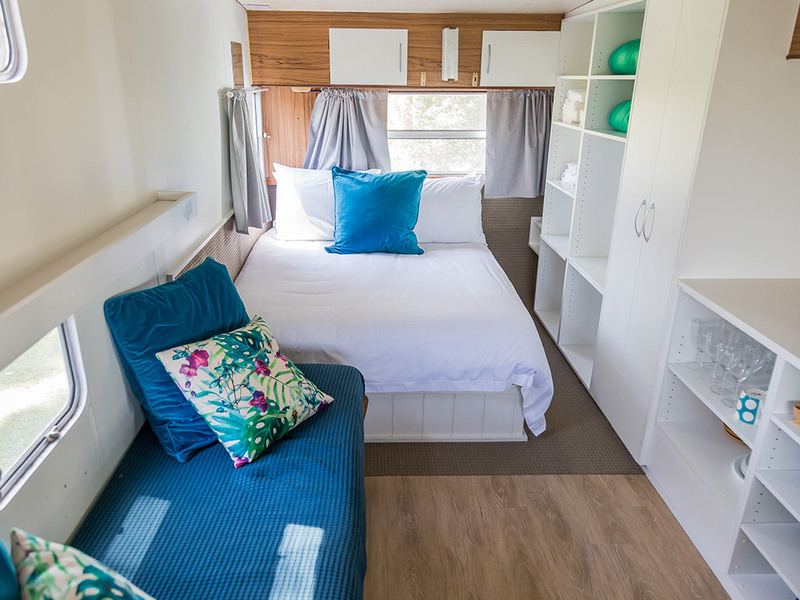 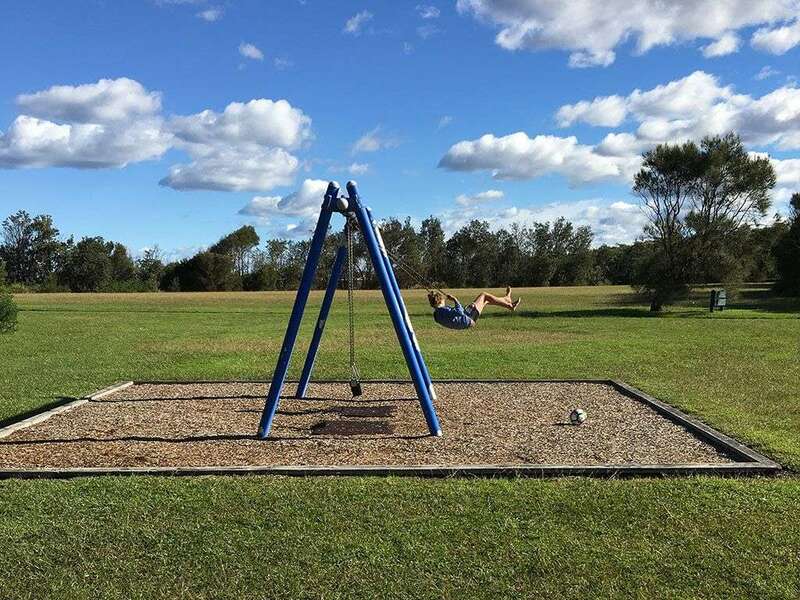 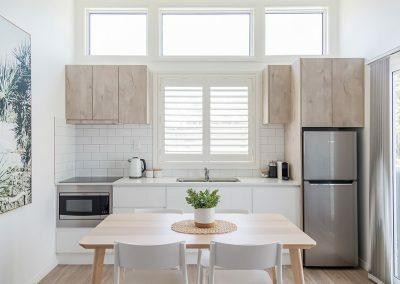 With a Queen bed in the caravan and a day bed in the annex that converts to two comfy single beds, this is the perfect budget getaway for a couple or a family of four. 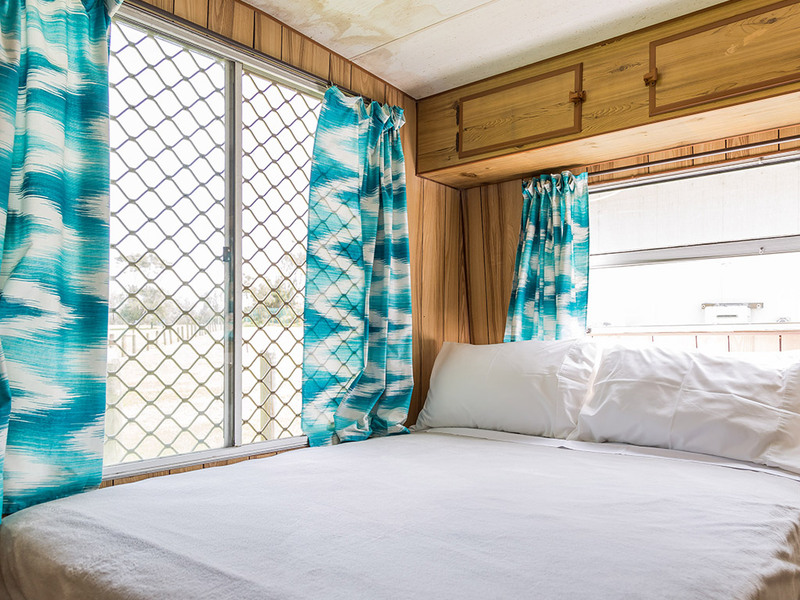 It features two balconies, one with a BBQ at the front as well as a private balcony at the back with lagoon glimpses. 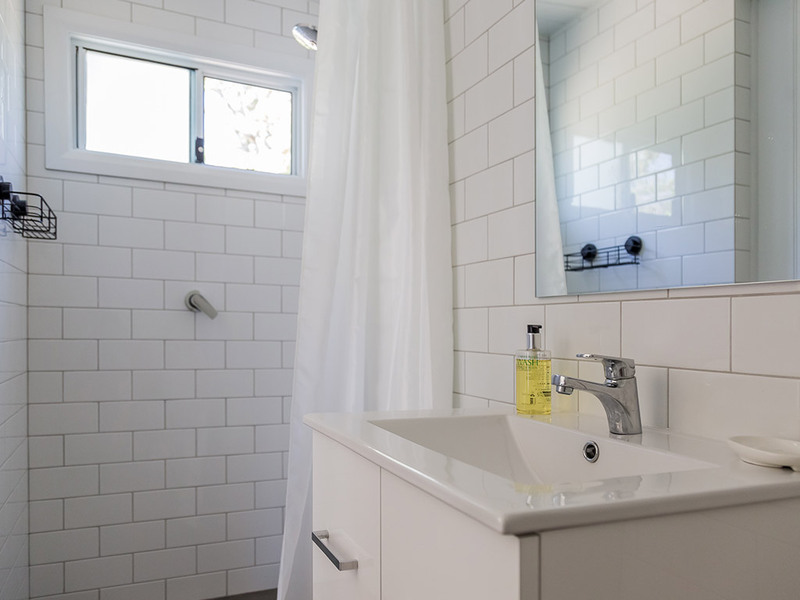 The ensuite is brand new with a shower, toilet and hand basin. 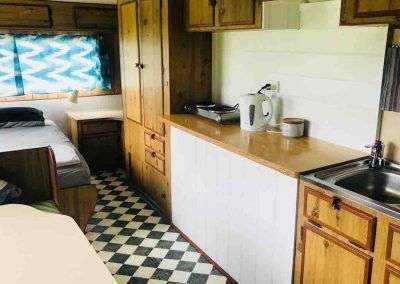 There is a kitchenette in the caravan with sink, microwave, kettle and toaster. 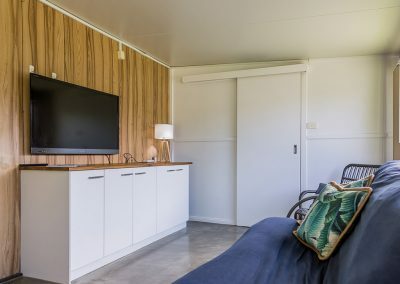 A full size fridge and TV with Netflix are in the annex. Quality linen and towels are supplied. 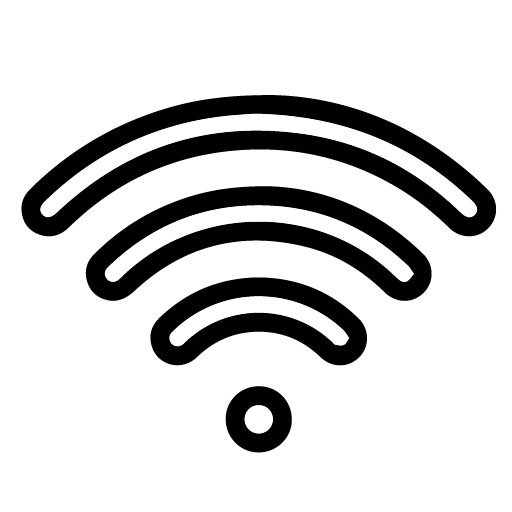 Includes WIFI. 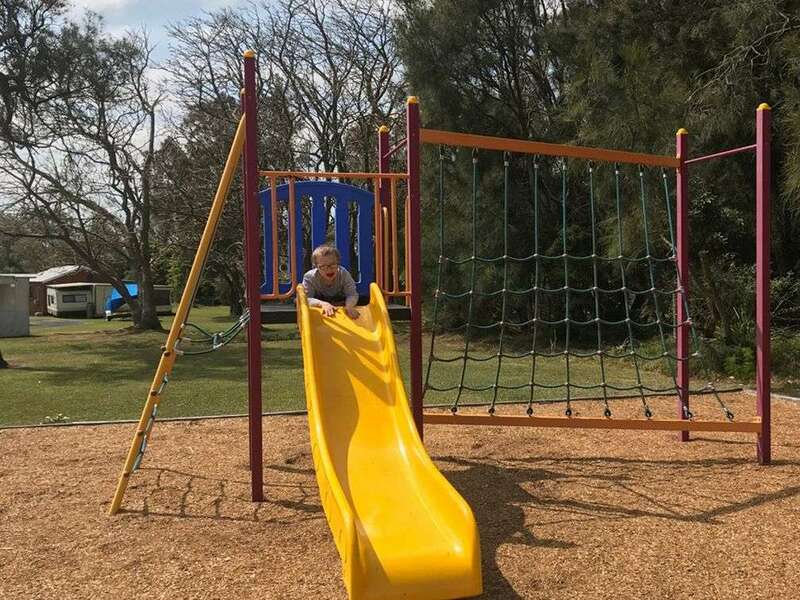 A fantastic budget option in a great location near the playground and surf lookout on Third Ave. 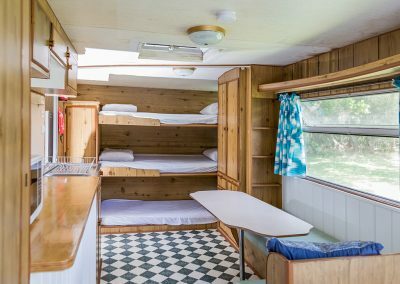 There is a double bed in the caravan and a set of triple bunks for the kids in the caravan. 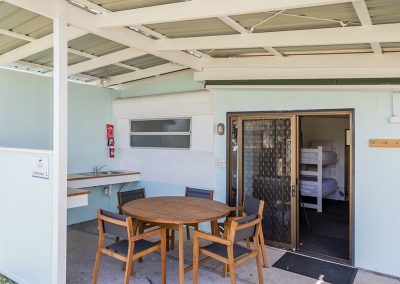 The annex is spacious with a futon lounge that converts to a double bed and there is also a TV. 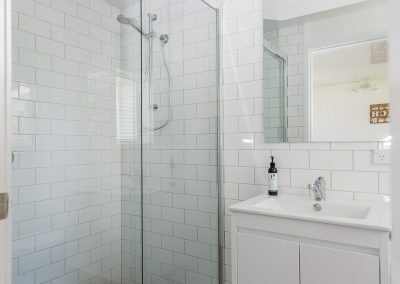 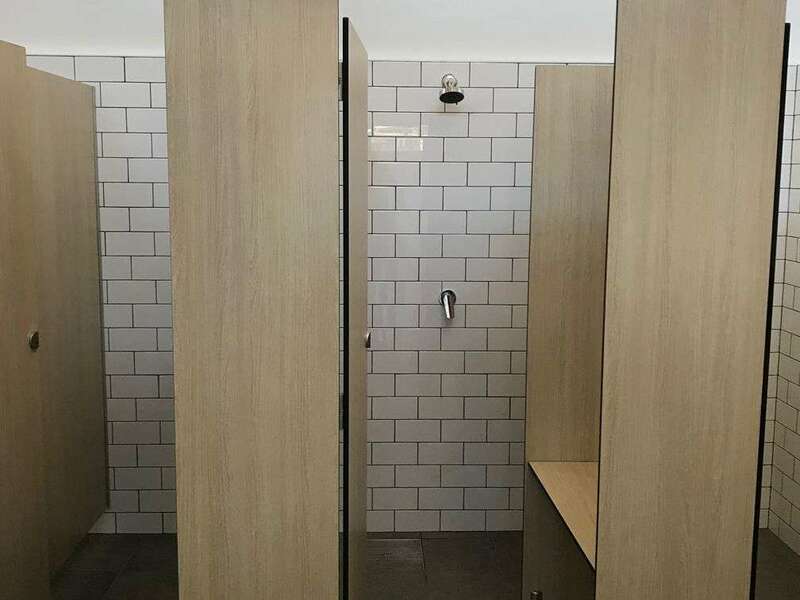 The ensuite has a shower, toilet and hand basin. 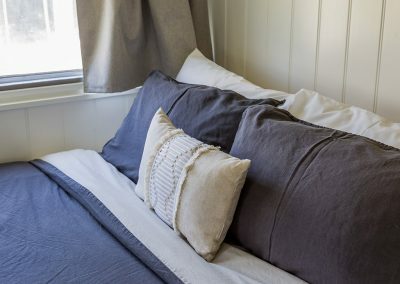 No linen is included but we do provide pillows and blankets. BYO towels, sheets and pillow cases and extra blankets or sleeping bags if you feel the cold. 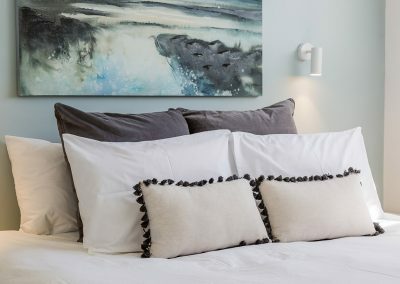 If required, we can arrange for linen for use during your stay at an extra fee of $30 per stay. 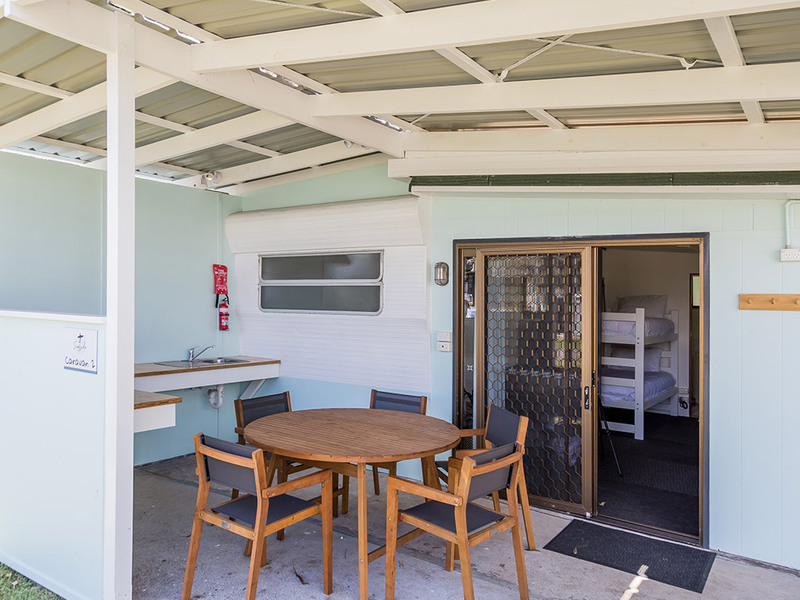 We offer a limited number of powered camp sites so we can maintain a relaxed and spacious feel during your stay. 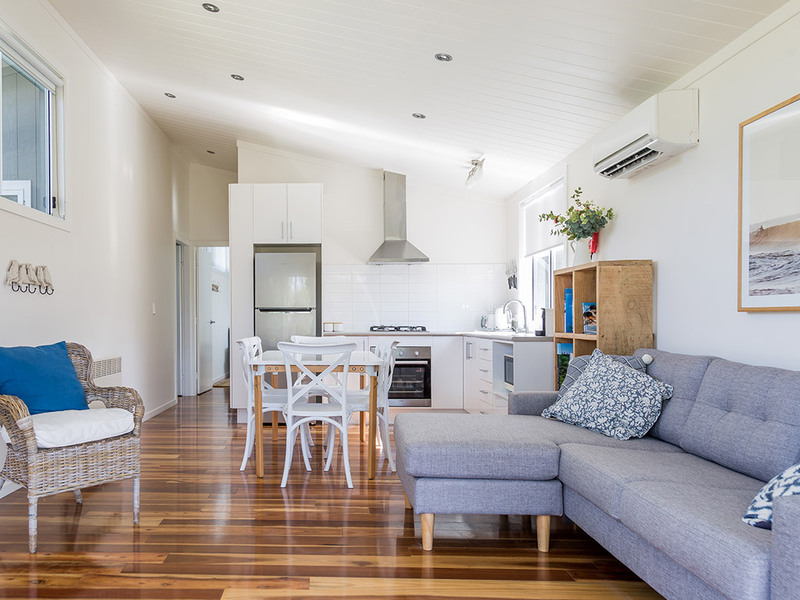 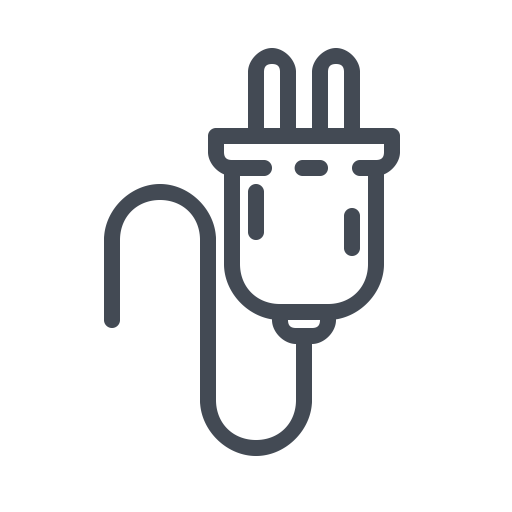 Call or e-mail us when you book to let us know your requirements so we can position you in the most suitable spot available. 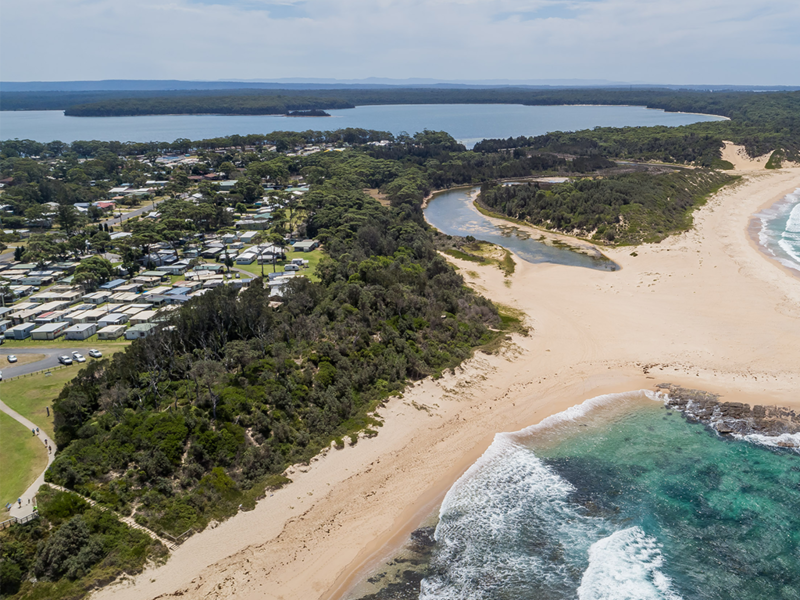 The sites all offer direct access to Cudmirrah Beach. 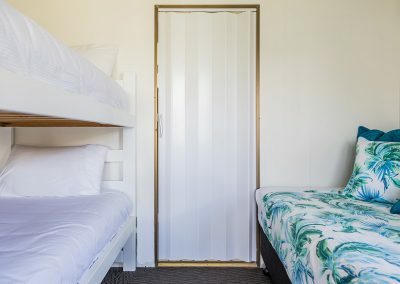 Extra adults are an additional $10 per night with a maximum of 4 adults per site. 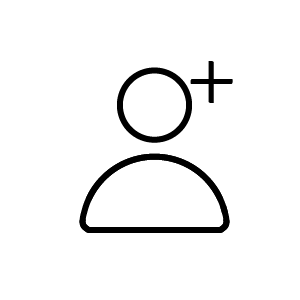 If you are bringing your pet, please let us know in advance. 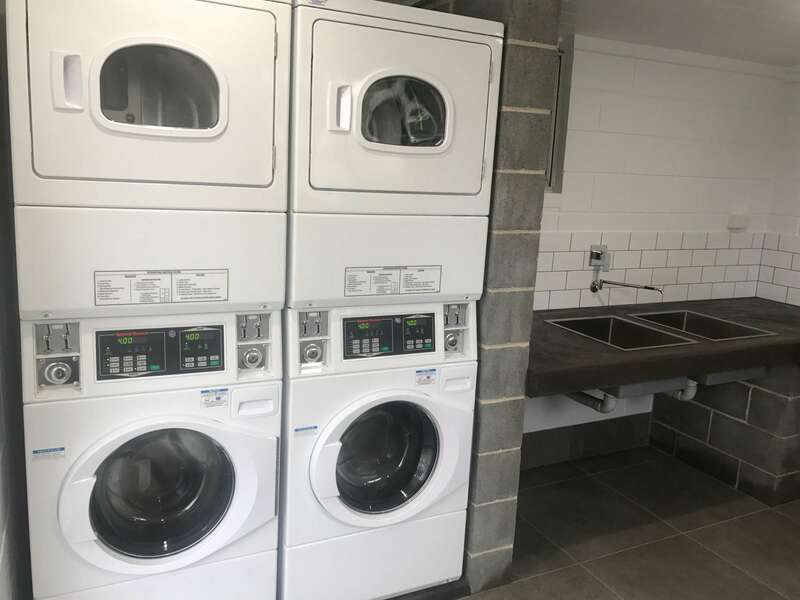 Our laundry has new machines and dryers and shower blocks have just been completely refurbished. 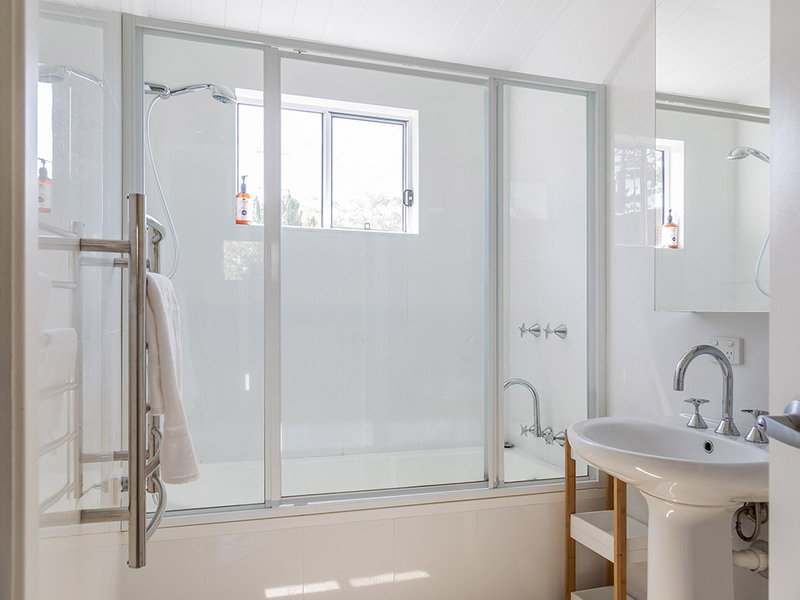 All ready for you to get sparkly clean in! 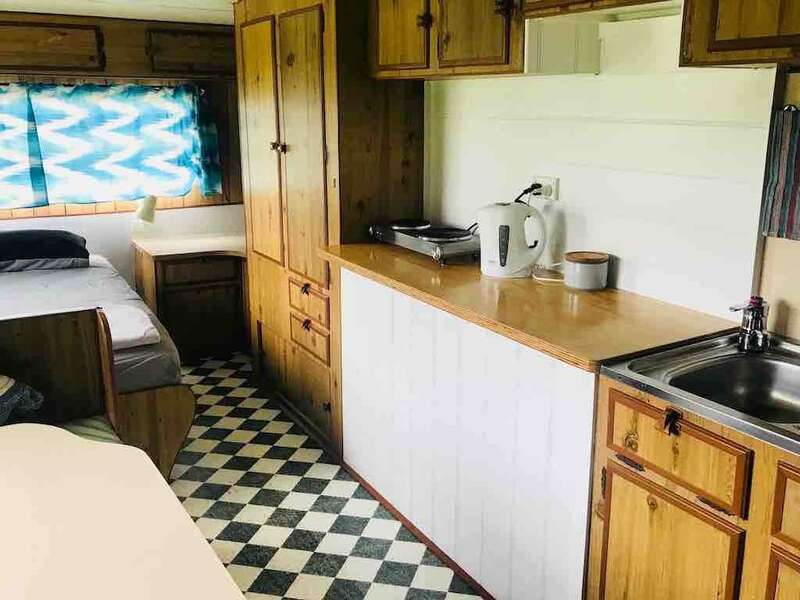 We have a brand new small camp kitchen with BBQ, sink, microwave, kettle and toaster. 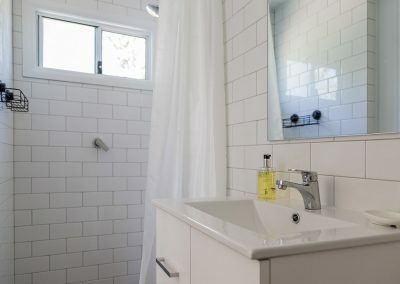 All kept beautifully clean for your convenience.